Institutional investors control approximately 75% of the market’s future direction, which is why we aim to keep ‘in sync’ with them. If you don’t, it feels like trying to swim against a strong current. When you don’t get in sync, you often get hurt financially and that’s why we like to see if the 800-pound gorilla investors are buying, because when they do, it strengthens the market. However, if they are selling, it weakens it. The other thing we like to keep a close eye on is the behaviour of leading stocks. If the markets best stocks are acting weaker than the general averages, it’s negative. However when leading stocks are outperforming the market, it’s positive. 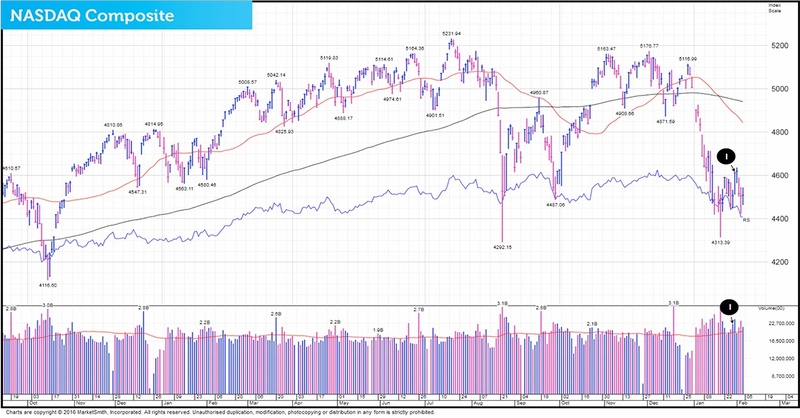 Since the uptrend began, the NASDAQ Composite has made a very impressive return of 252.9%1. However, to make that gain it has had to experience four quite challenging corrections. The first (Point B) occurred from April to November 2010. The second (Point C) is a correction that started in May 2011 and ended in January 2012. This second one was quite harsh and resembled a ‘mild’ bear market’. The third (Point D), began in late March 2012 and finished March 2013. The final one is occurring right now and resembles the 2011 retracement. This one therefore also has the hallmarks of a ‘mild’ bear market and it began last July (Point E). The good news for equity investors is that this present one looks like it’s just found a bottom which would mean that it’s now on its way back up. 1 Performance data taken January 28th 2016. 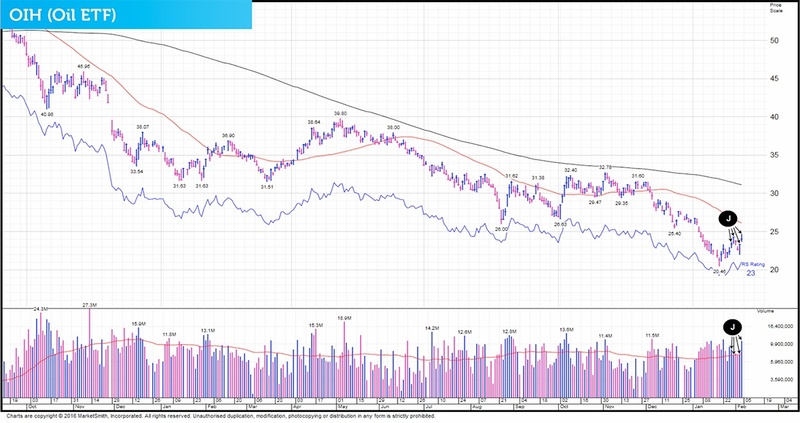 In our Daily Market Update on Thursday January 28th, we pointed out quite a few key points. We also pointed out that the Dow had followed through on Tuesday January 26 and that the Nikkei 225 had followed through Wednesday Jan 27. (Point H). ‘Taking all these things into consideration, we are of the belief that the market has bottomed and it’s now on its way back up. This latest rally is clearly broad and has legs. However from here it’s not going to go back up in a straight line. Instead we’ll continue to see and experience extreme volatility and that means from time to time the market will have some big down days. However our take is that when we start to look at things on a week by week basis, we are confident that as we progress forward in time, we’ll start seeing the market and our investments trending higher. What we have just gone through is perfectly normal even though it’s not been nice to experience. 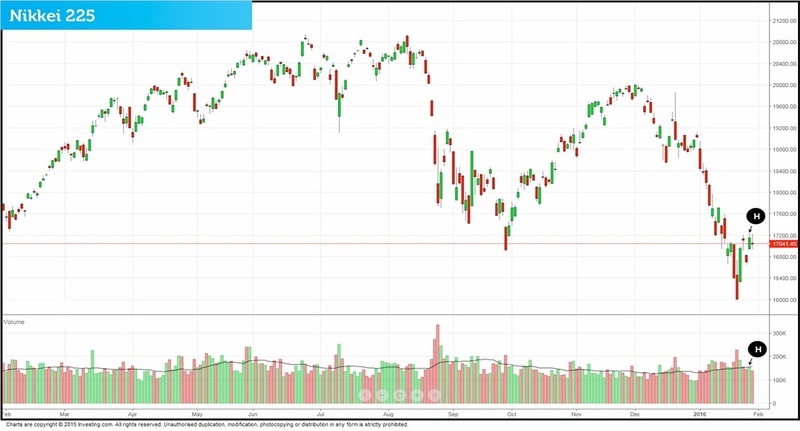 A ‘significant’ correction in the markets was well overdue and the good news is that this recent retracement has helped the markets to ‘reset’. That means from here we believe there will be some good money to be made especially over the next two to three years. On Friday February 5 the index and stock action was neutral. The NASDAQ Composite fell 3.25% (Point K) in above average volume (Point L). This type of behaviour normally suggests that institutional investors were selling stock. Leading stocks action was positive. 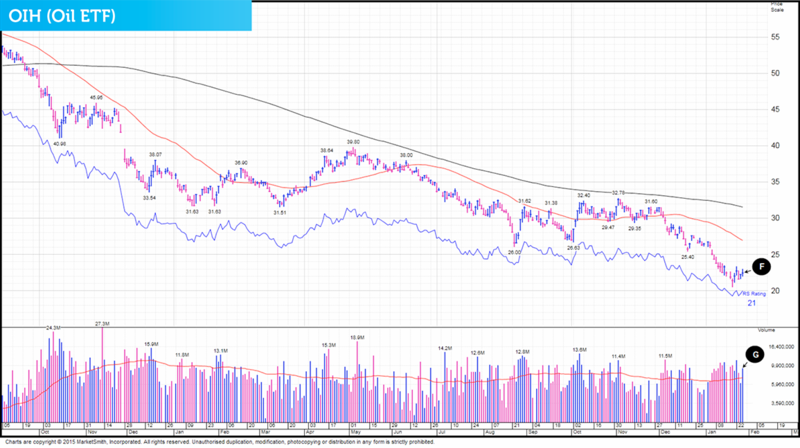 Even though a larger percentage of quality equities fell in heavy trade compared to those which advanced in heavy trade, nine leaders made gains and only seventeen fell. This is very unusual ‘bullish’ activity. It also suggests that the majority of Fridays selling was more likely to have come from the uneducated, uninformed investors. 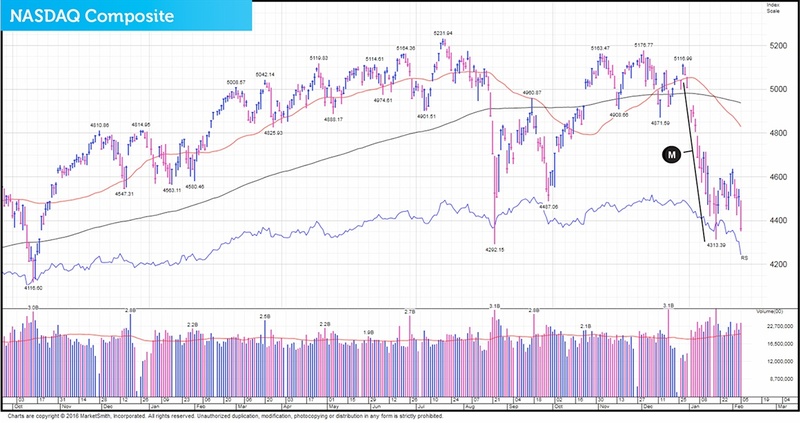 Friday’s action did take us by surprise especially with the NASDAQ selling off hard and closing at a level which has now effectively killed its latest rally attempt. However there are still far more positives than negatives. For example, leading stocks acted well despite the intense sell off. The S&P 400, 500 and 600’s rallies are still in play despite the brutal selling. The Dow, the Nikkei 225 and the oil sectors rallies are also still intact. 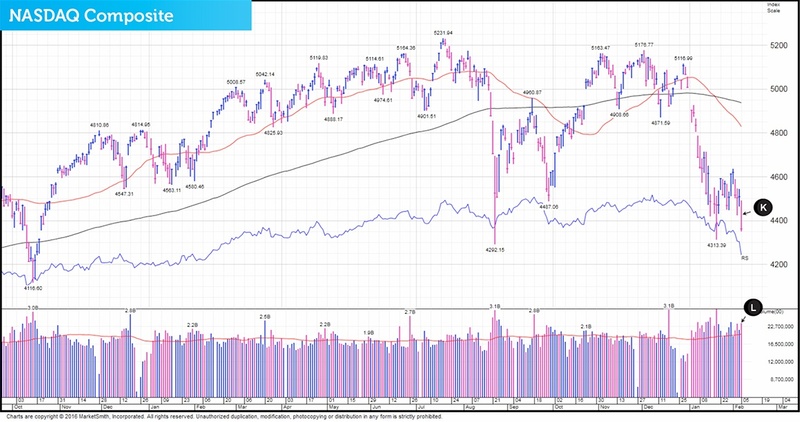 The reason we believe why we have seen the NASDAQ roll over is most probably because of the 15.7% drop it experienced in the 3 week period between December 29 and January 20 (Point M). When an index, stock, fund or sector experiences such falls in a very short period of time, it is literally impossible for it to rebound in a straight line. Retesting lows is therefore normal and natural. Often the ‘old low’ is breached which could happen in the NASDAQ’s case. 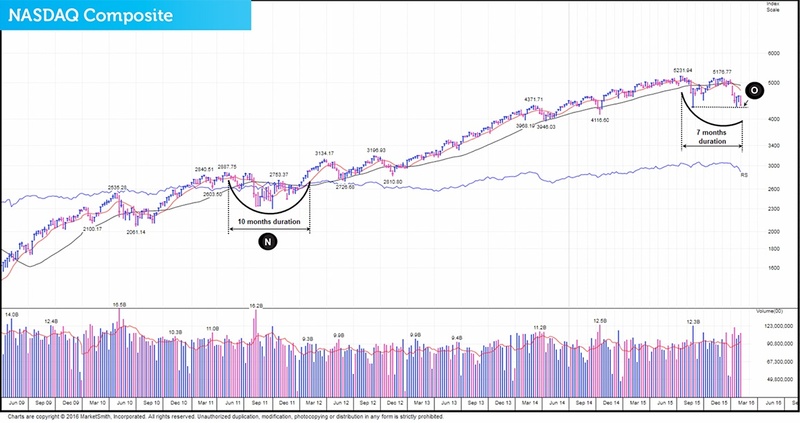 However let’s remind ourselves that this correction is very similar to the 2011 ‘severe bull market’ correction that lasted ten months (Point N) This retracement is so far seven months old which means we are likely to remain in correction territory possibly until Spring or even Summer 2016. 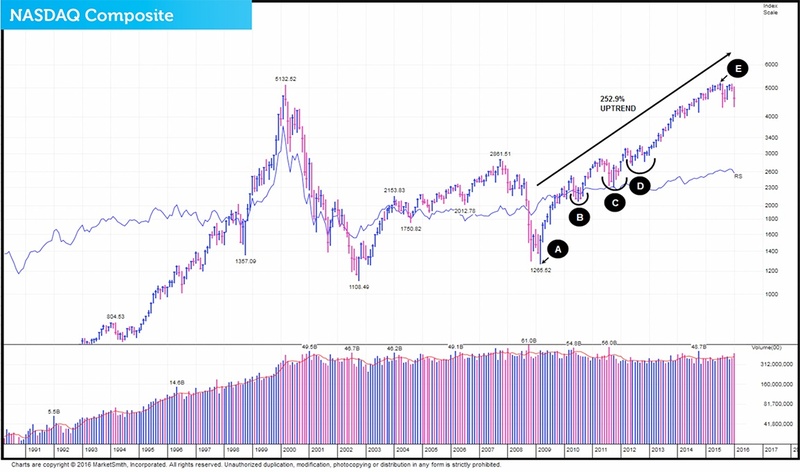 It’s a fact that the NASDAQ does has a lot of support at its current levels (Point O) and therefore we’d be very surprised if it didn’t rally soon from this point. ISACO are a specialist in ISA and SIPP investment and together with our clients have an estimated £75 million actively invested2. To help investors like you, we offer a high end service called ‘Shadow Investment’. Put simply, we invest and you invest beside us. As we grow our wealth, you grow yours. We have an active investment strategy which aims to control risk and deliver superior performance. Over the last 18 years3, we’ve beaten the FTSE 100 by 99.7% and over the last 3 years4, we’ve made an average annual return of 9.8% versus the FTSE 100’s 1.9%. 3 December 31st 1997 - December 31st 2015 ISACO 121.0%, FTSE 100 21.3%. 4 December 31st 2012 – December 31st 2015.